Soft and sweet with a hint of warming spice these baked pears are perfect cold weather eating. Delicious by themselves but when served with a rich crumble and cream they become an indulgent treat. Even though it hasn’t been that cold, even by Brisbane winter standards, I have been taking the opportunity to enjoy warm treats such as this. It’s all too easy to use the cold weather as an excuse to indulge but I have been enjoying plenty of healthy winter foods, such as porridge and soups, too. What are your favourite winter foods? What have you been cooking? Peel, halve and core the pears. Place cut side up in a snug fitting oven proof dish. Sprinkle over 1 tbsp sugar on each pear half then add the vanilla, cinnamon and water. Cover with foil and bake for 1.5 hours. Place all of the dry ingredients in a bowl and stir. Add the butter and, using just fingertips, gently rub it into the flour mix until it looks crumbly. The crumble only takes about 10 minutes to cook at 200C. 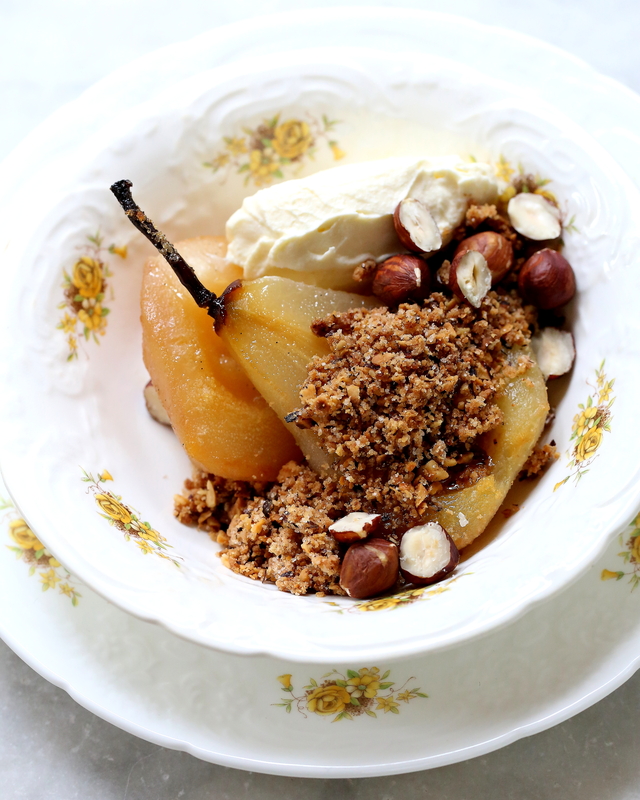 You may cook the crumble with the baked pears. For the last 10 minutes of cooking for the pears, remove the foil, add the crumble and increase the oven temperature to 200C. I opted to cook the crumble separately from the fruit as I was intending to eat it over a few days and wanted the crumble to stay crisp. I placed the crumble mix on a lined tray and cooked for 10 minutes. Once cooked and cooled, I stored it in an air-tight container. 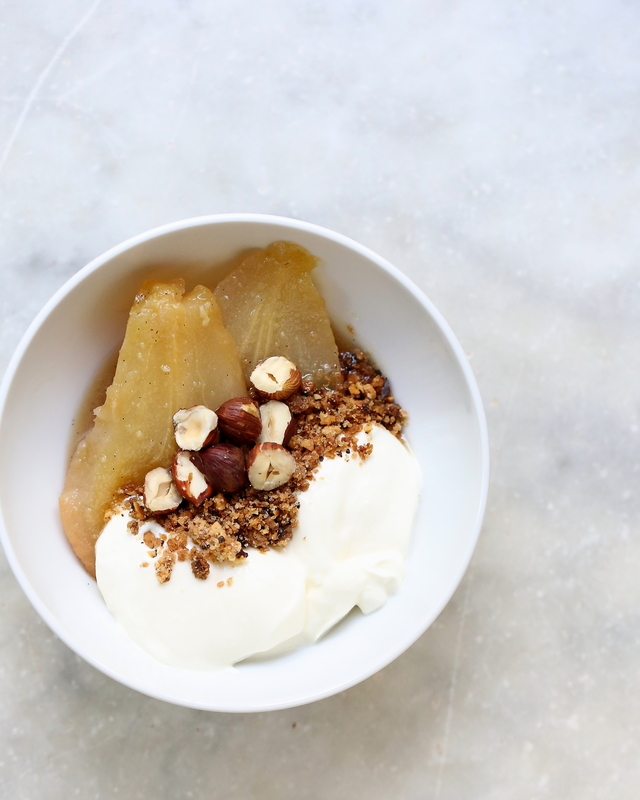 Serve the pears either hot or cold with the crumble, nuts (hazelnuts or walnuts), ice-cream, cream or yoghurt. Posted in FruitTagged autumn fruit, pears, Stephane Alexander, The Cook's CompanionBookmark the permalink. wow! delicious! thanks for sharing! Beautiful, Stephanie. This dessert is so elegant and I love all the different textures. Delish!